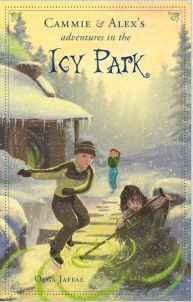 Home > Accessories > Children's Book "Icy Park"
Cammie turned around and skated in the opposite direction. She knew she was going really fast. She did a three turn, ready to spring up. Now! She lifted herself off the ice. A dark figure loomed in front of her, blocking her path. She felt a strong blow on the shoulder and went down with a loud thud. Cammie Wester and Alex Bernard love living in Skateland. There is one very important rule, however: skaters aren’t allowed to skate in the Icy Park, a dark and mysterious forest. When Cammie comes in first place at the annual Skateland competition, she believes she needs to start working on triple jumps to win at the nationals. But then her coach tells her she isn’t ready for triples, Cammie tries the jump on her own in the Icy Park. When something terrible happens, something that threatens Cammie’s skating career, Cammie will need the help of her best friend, Alex, to rediscover her love of skating!